Pablo Valentino is a talented French DJ from East France and has been DJing since 1997. 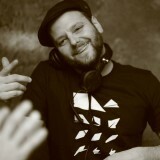 A well travelled and very knowledgeable music collector, Pablo loves to play across the board be it Jazz / Funk, Boogie / Disco, House / Broken Beat to Hip Hop, if it has soul there are no boundaries as Pablo creates unique musical patterns as he explores music with feeling and soul past, present and future. Pablo is the founder of FACES Records – featuring releases from Simbad and Danilo Plessow’s Motor City Drum Ensemble/Inverse Cinematics aliases – and releasing 12”s under his Creative Swing Alliance, Kid Swing and Hipster Wonkaz pseudonyms. Not content with that Pablo also co-runs the already iconic and buy-on-sight MCDE imprint with Danilo and is an influential component in the label gaining notoriety and cult status with its ‘Raw Cuts’ series – ubiquitous in many a DJ’s set regardless of genre. Both labels release ‘quality’ and not ‘quantity’ from such artists as Motor City Drum Ensemble, L’Aroye, The Revenge, Simbad, Mono/Poly, RedNose Distrikt, Kira Neris, grooveman Spot and his own Creative Swing Alliance Project.